Matching the holes. If you're you upgrading to a different type of tuner, you may want to find a set with holes that match the holes of the original. This is especially true if your guitar has some vintage value or you expect it to have vintage value in the future. Tuner weight. 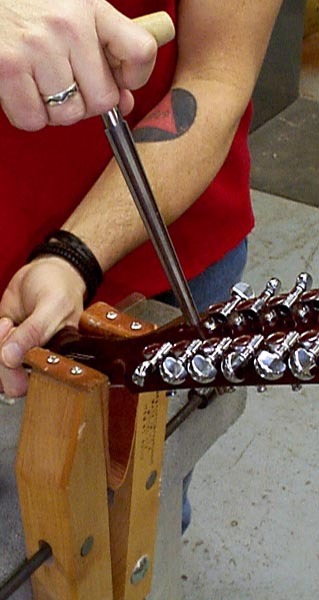 The weight of tuners varies slightly, but it's enough in some cases to make cause an imbalance in your guitar. Gear ratio. Tuners come with various gear ratios (the number of times you have to turn the button for the string post to make one full turn), such as 12-to-1 or 16-to-1. The theory is, the higher the ratio, the easier it is to fine-tune your guitar, but in reality, a poor quality tuner is a poor quality tuner, regardless of the ratio. If you like what you've been using, then stick with that ratio. 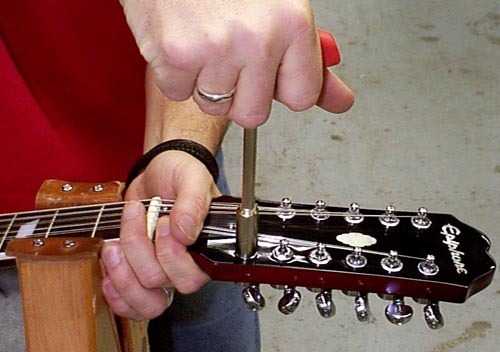 We have decided to replace the tuners on an Epiphone 12-string with mini-Grovers. Step 1. Remove the phillips head screws from the backs of the tuners and remove. Step 2. 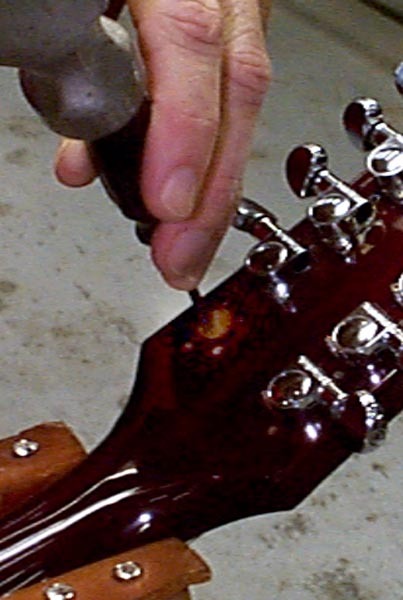 In this case, the original tuners utilize push-in bushings that the replacement tuners don't use, so we must remove them carefully. To do this without chipping the lacquer on the face of the peghead, use the small flat blade screwdriver and the small hammer. From the rear of the tuner hole, gently tap the screwdriver with the hammer against the inside of the bushing sleeve from side to side until they drop out. In some cases they may be loose enough to be pulled out by hand, or may even fall out once the tuners have been removed. Step 3. Our new Grovers have a threaded bushing and tuner housing assembly. Usually, the Grover tuner housing is slightly larger than the original tuner housing, so we will have to enlarge the hole diameter using the hole reamer. In most cases this will only need to be done from the rear unless the new threaded bushing will not fit through the hole from the front of the headstock. In that case we would ream out the front also. In this demonstration we didn't need to ream from the front. Gently turn the reamer and test fit the new tuner until it fits snugly through the newly reamed hole. We did this to all 12 holes. Step 4. Install the tuners and hand tighten the threaded bushings from the front. Align the tuners. In our case, the new Grover tuners have one less screw hole to be used than the previous tuners but those holes do line up with the new ones. Some replacement tuners may require the use of the drill to make pilot holes for new screws. Never install screws through lacquer without first making pilot holes because of the possibility of the lacquer chipping or even the wood cracking. Install the screws with the small phillips screwdriver. Step 5. Snug the threaded bushings from the front using the 11 millimeter nut driver. Step 6. String it up and go.